1. A bullet fired at an angle θ = 60o with a velocity of 20 m/s. Acceleration due to gravity is 10 m/s2. What is the time interval to reach the maximum height? 2. An object projected at an angle. The height of the object is the same when the time interval = 1 second and 3 seconds. What is the time interval the object in air. The object in the air for 4 seconds. 3. An aircraft is moving horizontally with a speed of 50 m/s. At the height of 2 km, an object is dropped from the aircraft. 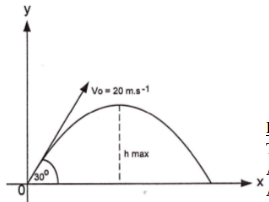 Acceleration due to gravity = 10 m/s2, what is the time interval before the object hits the ground. 4. A kicked football leaves the ground at an angle θ = 45o with the horizontal has an initial speed of 25 m/s. Determine the distance of X. Acceleration due to gravity is 10 m/s2. Projectile motion could be understood by analyzing the horizontal and vertical component of the motion separately. The x motion occurs at constant velocity and the y motion occurs at constant acceleration of gravity. The time in air calculated with the equation of the upward vertical motion. Calculated using the equation of the uniform linear motion with constant velocity. 5. An object projected upward at an angle θ = 30o with the horizontal has an initial speed of 20 m/s. Acceleration due to gravity is 10 m/s2. Determine the maximum height. Calculate the maximum height. Choose upward direction as positive and downward direction as negative. The maximum height is 5 meters. 6. An object is thrown at a certain elevation angle. The height of the object same after 1 second and 3 seconds. Determine time in air. Time in air = 4 seconds. 7. An aircraft is moving horizontally with the speed of 50 m/s. When the aircraft at the height of 2 km, an object free fall from the aircraft. Determine the type of the motion. The object is dropped from the moving plane because it has the same speed as the plane’s speed, that is 50 m/s. Movement of objects is not like free fall motion but parabolic motion. The case is the same as you are dropping objects from inside a moving car.